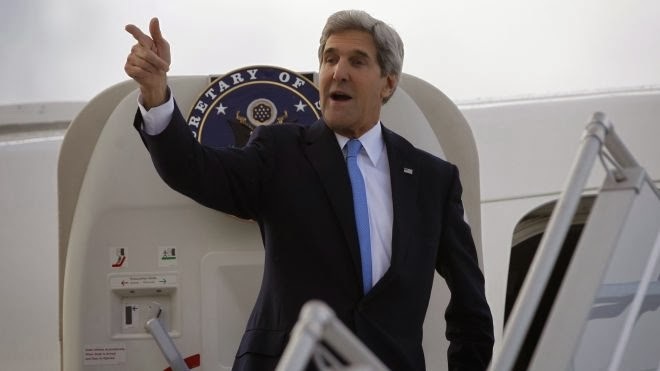 U.S. Secretary of State John F. Kerry said today that the Geneva talks ended with no deals in place because the Iranians were unable to accept the terms proposed unanimously by the major powers without seeking additional approval from senior leaders in Tehran. “There is still a gap in what they’re able to accept,” Kerry said of the Iranian delegation headed by Foreign Minister Mohammed Javad Zarif. He made the comments during a visit to Abu Dhabi. Earlier reports had indicated that last-minute objections by the French over the text of the final agreement, especially regarding the construction of Iran’s plutonium-producing reactor in Arak and the specific limits on its uranium enrichment, was the stumbling block in reaching an agreement in the wee hours of Sunday morning. Now Kerry says that all major powers, including France, did ultimately agree on a draft agreement acceptable to all of them, including Russia and China, but the Iranians could not sign off on it without additional approval from Tehran. The next meeting will be held on 20 November in Geneva to try to close the gap between the two sides and strike a deal on Iran's nuclear program. Ultimately, I predict that Iran will accept even the new harsher terms motivated by France. Although Iranian culture likes dishonesty, game playing, tarof, blah blah blah -- there always comes a moment of reality when they realize the game playing will no longer be indulged and they assume their place. One example of this was when Khomeini "drank the poison" of surrendering to Iraq's demands. You are seeing another example of it here. If the west is smart, which they undoubtedly are, you will see regime change in a few years or so in this defeated regime. I wonder whether your hatred of Iranians stems from a personal experience or it is perhaps to do with your unconditional support for your 'first country', the country you do not hold citizenship or born-in but have a hidden alligence. I doubt this is personal because a rational and intelligent person would not paint a nation with a single brash of dishonesty based on personal experiences. PS: This reader is not a US resident and never will be. Baba !...............You will see regime change in a few years..........! @ -could you please connect OR solve THE EQUATION b/tween regime change, with a nuclear deal between the p5+1 and IRAN.!!. DISHONESTY ! from the P5+1! YOU dont need to have a mole in the meeting to understand the unwillingness on the part of the US to make a real deal with Iran.It is wrong for the US secretary to accuse the Iranian delegation of taking their decisions from somewhere ,putting a picture of an IRAN that is not ready for a deal!.France did surprise a few people there and some day truth will come out a yet another tactic by the US to demand more from IRAN.there IS NO WAY France COULD HAVE TOPOE THE DEAL WITHOUT a secret collective approval from the rest!. hell bent to stop the Iranian Nation in its pursuit in peaceful nuclear energy -time and patience is running out quickly from this crazy club influenced by Saudi Arabia and Israel!. saying that the Iranian people will see a change in the present oppressive and dishonest regime is not at all indicative of a hatred for Iranians. on the contrary it seems to be motivated from a desire to see the Iranian people have a better government and a chance at a better future. The terms must have cut into issues of Iranian national sovereignty, such as operation of Arak reactor, right to the fuel cycle, etc. Interesting to see what comes forth from the next meeting. "No amount of spinning can change what happened within 5+1 in Geneva from 6PM Thursday to 545 PM Saturday.But it can further erode confidence"
The comment of AnonymousNovember 11, 2013 at 9:11 AM, IS indicative of a hatred for Iranians. This individual does not distinguish between the Iranian people and the government that represent them. I suggest you read his/her last two comments where he specifically refers to Iranian people as liars, deceitful and dishonest: 'Iranians' tendency to lie ...", "Iranian culture likes dishonesty ..."
I am not offended at all but just curious on his psychic state. "Although Iranian culture likes dishonesty, game playing, tarof, blah blah blah", this from a paid shill for a state that relies on more shills to post propaganda for it, on the internet, otherwise known as hasbara! Is Zarif talking about Kerry's comments? Kerry's was referring to a late Saturday night agreement among all the six major powers on a unified draft agreement that was then presented to the Iranians. Is Zarif saying that the unanimity among the six on a draft agreement never happened? I believe Zarif is referring here to what happened on Saturday afternoon when the French started objecting to the text on Arak and level of enrichment. But if Kerry is right, the six, including France, ultimately agreed on a unified draft agreement. you show such a small regard for honesty.......... signing the NPT cut into Iran's sovereign prerogatives regarding operation of a heavy-water reactor....... but had Iran not again and again been found to have failed to meet the terms of the NPT, things never would have gotten this far. try an occasional bit of basic honesty, my man. you'll benefit from being less of a fanboy. Anon 12 at 12:16am......'try an occasional bit of basic honesty, my man .You'll benefit from being less of a fan boy!! -@since when did you try basic honesty on the I.R.I ?.-try it and you will stand tall and less an avid blind supporter of the West . reader--- fair enough. thank you for the explanation. most probably he is a kurd or arab babbling from a foreign land with chip on his shoulder aka inferiority complex. Recent Nigerian convert to shia islam? Iran has every right to operate a heavy water or any other reactor type that it sees fit,it is in full compliance with the npt and the iaea has certified that there has been no diversion of fissile material.You seem to think that repeating the same old lies over and over again somehow makes them true,it doesnt.
" most probably he is a kurd or arab babbling from a foreign land with chip on his shoulder aka inferiority complex." almost funny how some Iranians think that their neighbors might feel inferior to Iranians when the reality of it is that it's been a couple of thousand years since Iran was the envy of anyone. That makes a difference from zionists who just consider everyone else as inferior "goyim".